Eating is produced by two categories of signals. Homeostatic signals emerge from the body’s need for nutrients, is associated with feelings of hunger, and usually work to balance intake with expenditure. Non-homeostatic eating, on the other hand, is not tied to nutrient needs or hunger but rather to the environment, to emotional states, and or to the pleasurable and rewarding qualities of food. These cues can be powerful signals to eat even when there is no physical need for food. 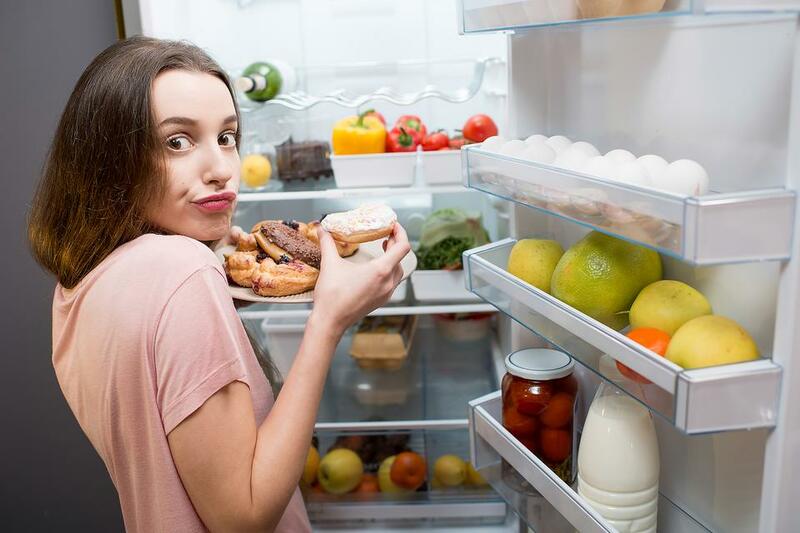 External eating is non-homeostatic eating in response to the environmental stimuli that surround us, including the sight and smell of food or the sight of food related cause such as the time of day or a fast food restaurant ad or sign. 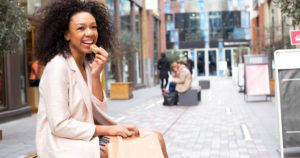 Mindful eating involves paying attention to eating while it is occurring, including attention to the sight, smell, flavors, and textures of food, to the process of chewing and may help reduce intake. Indeed, high levels of mindfulness are associated with lower levels of obesity and mindfulness training has been shown to reduce binge eating, emotional eating, and external eating. In today’s Research News article “Effects of a Brief Mindful Eating Induction on Food Choices and Energy Intake: External Eating and Mindfulness State as Moderators.” (See summary below or view the full text of the study at: https://link-springer-com.ezproxy.shsu.edu/article/10.1007%2Fs12671-017-0812-0 ), Allirot and colleagues examined the effects of a very brief mindful eating instruction on subsequent food intake. The participants then tasted 4 finger foods, tomato and mussel brochette with vinaigrette, ham and goat cheese brochette with pine nuts and walnuts, fruit brochette, of chocolate candy and rated their liking for the foods. They were then presented with a buffet containing the 4 finger foods and asked to fill out questionnaires about their eating and told to eat however much of the foods they wanted. They were measured before and after the taste test and after the buffet for subjective appetite, hunger, fullness, and desire to eat. They were measured for mindfulness after the taste test and the amounts of foods eaten during the buffet were recorded. The next day they completed measures of restrained, emotional, and external eating behavior. They found that the group instructed in mindful eating during the buffet test ate fewer high-density finger foods and ingested less overall food energy (calories) than the control group. This occurred even though there were no differences in the liking for the foods, or intake of low-density finger foods. They also demonstrated that the mindful eating group in comparison to the control group ate fewer finger foods and less food energy when their mindfulness levels were high regardless of their propensity for external eating. The findings suggest that mindful eating, even when only induced by a brief instruction, can alter the amounts and types of foods subsequently eaten. One design issue with the study is that the participants were only allowed 15 minutes for the buffet test. Mindful eating instructions specifically instruct slower eating. So, the instruction might have reduced intake by slowing down eating during a fixed period. Nevertheless, the results are suggestive of the ability of mindful eating to reduce intake. So, reduce eating with mindfulness. 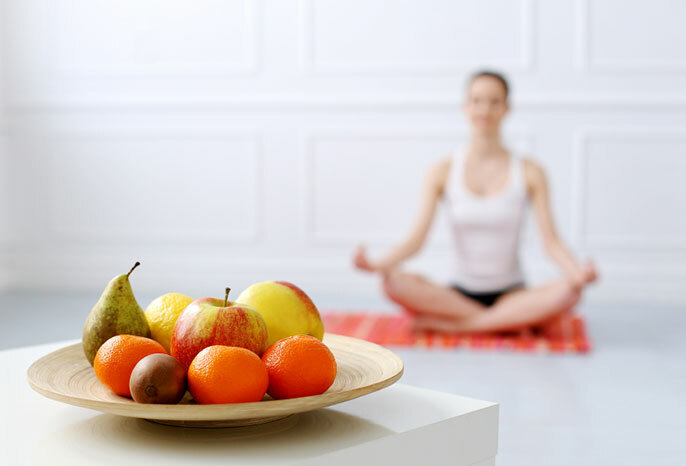 Mindfulness techniques have been shown to have protective effects on eating. However, no studies have been conducted on the effect of a single mindful eating (ME) induction on subsequent food choices and intake, and the way eating behaviors and the mindfulness state might moderate this effect. The objectives of the present study were to assess (1) the effect of an ME induction on food choices, intake, liking, and appetite, and (2) whether eating behaviors and the mindfulness state moderate the effect on intake. Seventy adult women (35.27 ± 1.27 years old; body mass index 22.79 ± 0.44 kg/m2) were invited to a tasting session. Participants in the mindful group received the instruction to taste the foods in a mindful manner (without meditation training). Participants in the control group were instructed to taste the foods with no specific recommendations. Afterwards, participants were offered an individual buffet-style snack containing the foods previously tasted. During this snack, the mindful group showed a reduced number of high-energy-dense food items eaten (p = .019) and a decreased energy intake (p = .024), compared to controls. No differences were found between groups on appetite and liking. Moderation analyses showed that the ME induction was able to reduce the total number of food items and energy intake in participants who combined higher levels of external eating and lower levels of mindfulness state. Results encourage the promotion of ME, particularly in external eaters with low mindfulness state levels, and they support ME as a strategy to promote healthy eating. Mindful eating involves paying attention to eating while it is occurring, including attention to the sight, smell, flavors, and textures of food, to the process of chewing and may help reduce intake by affecting the individual’s response to non-homeostatic cues for eating. Indeed, high levels of mindfulness are associated with lower levels of obesity. Hence, mindful eating may counter non-homeostatic eating. Acceptance and Commitment Therapy (ACT) is a mindfulness-based psychotherapy technique that is based upon Cognitive Behavioral Therapy (CBT). ACT focuses on the individual’s thoughts, feelings, and behavior and how they interact to impact their psychological and physical well-being. It then works to change thinking to alter the interaction and produce greater life satisfaction. ACT employs mindfulness practices to increase awareness and develop an attitude of acceptance and compassion in the presence of painful thoughts and feelings. Additionally, ACT helps people strengthen aspects of cognition such as in committing to valued living. ACT teaches individuals to “just notice”, accept and embrace private experiences and focus on behavioral responses that produce more desirable outcomes. In today’s Research News article “The effects of acceptance and commitment therapy on eating behavior and diet delivered through face-to-face contact and a mobile app: a randomized controlled trial.” (See summary below or view the full text of the study at: https://www.ncbi.nlm.nih.gov/pmc/articles/PMC5828146/ ), Järvelä-Reijonen and colleagues examine the effectiveness of Acceptance and Commitment Therapy (ACT) on facilitating mindful eating and as a result improving eating behavior and diet. They recruited overweight and obese adults (aged 25-60 years) and randomly assigned them to receive ACT either face-to-face in a group setting or on line or to a no-treatment control. ACT was delivered for 90 minutes, once a week over 8 weeks. The participants were measured before and 2 weeks and 28 weeks after the intervention for perceived stress, intuitive eating, including unconditional permission to eat, eating for physical rather than emotional reasons, and reliance on internal hunger/satiety cue. They were also measured for cognitive restraint of eating, uncontrolled eating, emotional eating, taste pleasure, using food as a reward, eating attitudes, food acceptance, internal regulation, contextual skills, and eating behaviors, including intrinsic motivation, integrated regulation, identified regulation, introjected regulation, external regulation, and amotivation. Finally, they were measured for food and nutrient intakes including alcohol. They found that both the face-to-face and the on-line Acceptance and Commitment Therapy (ACT) training produced significant improvements in the reasons for eating from emotional or environmental triggers towards hunger and satiety cues, acceptance of a variety of foods, and perceptions of healthy eating. They also showed significant increases in eating for physical rather than emotional reasons while decreases in using food as a reward. In general, the face-to-face ACT training produced larger improvements than the on-line ACT training. But, both were effective. Even though there were many improvements in the psychological components surrounding eating produced by ACT training, there were no significant changes in actual dietary intake. These results are interesting and suggest that ACT training, regardless of whether it occurs face-to-face or on-line, alters the psychology of eating toward more mindful eating and toward homeostatic eating. These are very healthy changes. The fact, however, that they were not reflected in actual changes in intake is disappointing. Perhaps if there was an active dietary reduction component, there might have been a change in intake. But, without this emphasis on intake reduction it is hard to see what the motivation might be for the participants to reduce the amounts of food ingested. It is also possible that given more time for the psychological changes to take hold, intake changes may have occurred. Finally, even though the participants were overweight and obese they were weight stable, neither increasing or decreasing intake. They were eating an appropriate amount for their metabolic needs, neither overeating nor undereating. So, changing then psychology of eating may not affect their intake as it is appropriate for the circumstances. So, improve eating behavior with mindfulness. Internal motivation and good psychological capabilities are important factors in successful eating-related behavior change. Thus, we investigated whether general acceptance and commitment therapy (ACT) affects reported eating behavior and diet quality and whether baseline perceived stress moderates the intervention effects. Secondary analysis of unblinded randomized controlled trial in three Finnish cities. Working-aged adults with psychological distress and overweight or obesity in three parallel groups: (1) ACT-based Face-to-face (n = 70; six group sessions led by a psychologist), (2) ACT-based Mobile (n = 78; one group session and mobile app), and (3) Control (n = 71; only the measurements). At baseline, the participants’ (n = 219, 85% females) mean body mass index was 31.3 kg/m2 (SD = 2.9), and mean age was 49.5 years (SD = 7.4). The measurements conducted before the 8-week intervention period (baseline), 10 weeks after the baseline (post-intervention), and 36 weeks after the baseline (follow-up) included clinical measurements, questionnaires of eating behavior (IES-1, TFEQ-R18, HTAS, ecSI 2.0, REBS), diet quality (IDQ), alcohol consumption (AUDIT-C), perceived stress (PSS), and 48-h dietary recall. Hierarchical linear modeling (Wald test) was used to analyze the differences in changes between groups. Group x time interactions showed that the subcomponent of intuitive eating (IES-1), i.e., Eating for physical rather than emotional reasons, increased in both ACT-based groups (p = .019); the subcomponent of TFEQ-R18, i.e., Uncontrolled eating, decreased in the Face-to-face group (p = .020); the subcomponent of health and taste attitudes (HTAS), i.e., Using food as a reward, decreased in the Mobile group (p = .048); and both subcomponent of eating competence (ecSI 2.0), i.e., Food acceptance (p = .048), and two subcomponents of regulation of eating behavior (REBS), i.e., Integrated and Identified regulation (p = .003, p = .023, respectively), increased in the Face-to-face group. Baseline perceived stress did not moderate effects on these particular features of eating behavior from baseline to follow-up. No statistically significant effects were found for dietary measures. 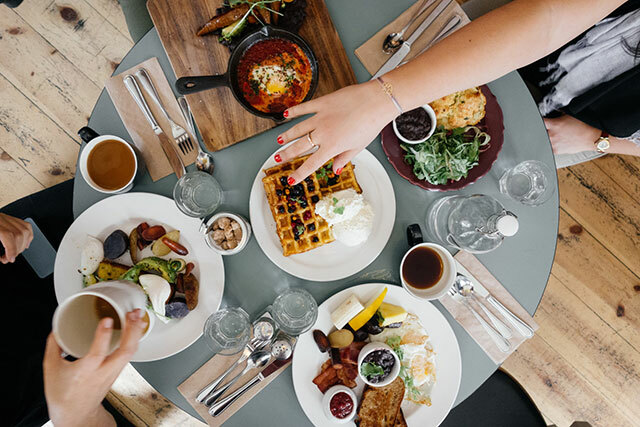 ACT-based interventions, delivered in group sessions or by mobile app, showed beneficial effects on reported eating behavior. Beneficial effects on eating behavior were, however, not accompanied by parallel changes in diet, which suggests that ACT-based interventions should include nutritional counseling if changes in diet are targeted. Around 30 million people in the United States of all ages and genders suffer from an eating disorder; either anorexia nervosa, bulimia, or binge eating disorder. 95% of those who have eating disorders are between the ages of 12 and 26. Eating disorders are not just troubling psychological problems, they can be deadly, having the highest mortality rate of any mental illness. Eating disorders can be difficult to treat because eating is necessary and cannot be simply stopped as in smoking cessation or abstaining from drugs or alcohol. One must learn to eat appropriately not stop. So, it is important to find methods that can help prevent and treat eating disorders. Contemplative practices, mindfulness, and mindful eating have shown promise for treating eating disorders. They found that the higher the levels of mindfulness the lower the levels of eating disorder cognitions but only for Asian and white American and not black women mindfulness was also associated with lower levels of eating disorder behaviors. They then performed a hierarchical regression to determine moderation effects and found that only for white women mindfulness moderated the effects of eating disorder cognitions on eating disorder behaviors such that high mindfulness significantly weakened the association of cognitions with behavior. 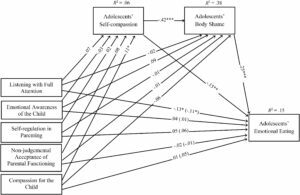 These are interesting results that suggest that how young women think about eating disorders affects eating disordered behavior. Mindfulness only appeared to influence this association for a single racial group, white American women. Since most research with eating disorders is performed with young white women, these results call into question the generalizability of mindfulness ability to reduce eating disorders. It would appear to be not true for black and Asian American women. Why mindfulness effects differ between racial groups is unknown and will require future research to investigate. What is clear is that how a woman thinks about her weight and self-worth is a significant contributor to the potential development of an eating disorder. This predicts that perhaps Mindfulness-Based Cognitive Therapy (MBCT) might be particularly useful in treating or preventing eating disorders particularly in white women. Obesity has become an epidemic in the industrialized world. In the U.S. the incidence of obesity, defined as a Body Mass Index (BMI) of 30 or above has more than doubled over the last 35 years to currently around 35% of the population, while two thirds of the population are considered overweight or obese (BMI > 25). Although the incidence rates have appeared to stabilize, the fact that over a third of the population is considered obese is very troubling. This is because of the health consequences of obesity. Obesity is associated with cardiovascular problems such as coronary heart disease and hypertension, stroke, metabolic syndrome, diabetes, cancer, arthritis, and others. Indeed, obesity has been found to shorten life expectancy by eight years and extreme obesity by 14 years. Obviously, there is a need for effective treatments to prevent or treat obesity. In today’s Research News article “Mindfulness and Laboratory Eating Behavior in Adolescent Girls at Risk for Type 2 Diabetes.” (See summary below or view the full text of the study at: https://www.ncbi.nlm.nih.gov/pmc/articles/PMC5878719/ ), Annameier and colleagues recruited overweight or obese adolescent girls between 12 to 17 years of age who were at risk for the development of Type II diabetes. They were measured for body size and composition, mindfulness, episodes of loss of control (binge) eating in the past month, their state of hunger, and depressive symptoms. They were also tested in the lab where they were provided a buffet lunch meal and instructed to eat till they were no longer hungry. As a test of eating in the absence of hunger, an hour after the beginning of the lunch the girls were provided with an array of snacks (e.g. popcorn, chips, candy, and ice cream) and asked to taste them and rate them for liking. They were then left for 15 minutes and told that they could eat as much as they’d like. Their intake of the snacks was measured. They found that the girls who reported engaging in loss of control eating during the previous month had higher body mass indexes (BMIs) and ate significantly more in the absence of hunger and tended to have lower mindfulness than the girls who did not report any cases of loss of control eating. They also found that the girls who reported engaging in loss of control eating ate more in the lunch when they were hungry. With the test of eating the snacks (eating in the absence of hunger) but not when eating hungry, they found that the higher the levels of mindfulness the lower the amount eaten. Hence, mindfulness is related to lower intake when hunger is absent but does not affect intake when hunger is present. This suggests that mindfulness does not affect homeostatic eating but rather only affects non-homeostatic food intake. This is important as responding to hunger with intake is adaptive, satisfying the body’s need for nutrients. On the other hand, eating in the absence of hunger is ingesting unneeded food energy and may contribute to overweight and obesity. The fact that mindfulness only appears to affect eating in the absence of hunger suggests that it tends to counteract this more harmful form of eating. So, reduce eating when not hungry with mindfulness. Mindfulness-based intervention has become increasingly popular to address disinhibited eating in obesity and type 2 diabetes (T2D). Theoretically, present-moment attention promotes the ability to recognize and respond to internal hunger cues and to differentiate physiological hunger from other stimuli. Yet, there is limited research describing the relationship of mindfulness with disinhibited eating patterns in adolescents. In this study, we evaluated the relationship of dispositional mindfulness to laboratory eating in 107 adolescent (12–17 years) girls at risk for T2D. Adolescents reported dispositional mindfulness, were evaluated for recent loss-of-control-eating (LOC-eating) by interview, and participated in two successive, standardized laboratory test meals to assess eating when hungry as well as eating in the absence of hunger (EAH). Adolescents rated state appetite throughout the test meal paradigms. In analyses adjusting for body composition and other possible confounds, mindfulness was inversely related to caloric intake during the EAH paradigm. Mindfulness did not relate to energy intake when hungry. Instead, there was a significant interaction of reported LOC-eating by state hunger, such that girls with recent, reported LOC-eating and high state hunger consumed more calories when hungry, regardless of mindfulness. Findings suggest that in girls at risk for T2D, mindfulness may play a role in disinhibited eating. A propensity for LOC-eating may be most salient for overeating in a high hunger state. Obesity has become an epidemic in the industrialized world. In the U.S. the incidence of obesity, defined as a Body Mass Index (BMI) of 30 or above has more than doubled over the last 35 years to currently around 35% of the population, while two thirds of the population are considered overweight or obese (BMI > 25). Although the incidence rates have appeared to stabilize, the fact that over a third of the population is considered obese is very troubling. This is because of the health consequences of obesity. 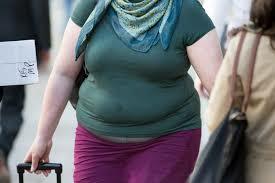 Obesity has been found to shorten life expectancy by eight years and extreme obesity by 14 years. This occurs because obesity is associated with cardiovascular problems such as coronary heart disease and hypertension, stroke, metabolic syndrome, diabetes, cancer, arthritis, and others. Obviously, there is a need for effective treatments to prevent or treat obesity. Eating is produced by two categories of signals. Homeostatic signals emerge from the body’s need for nutrients and usually work to balance intake with expenditure. Non-homeostatic eating, on the other hand, is not tied to nutrient needs but rather to the environment and or to the pleasurable and rewarding qualities of food. These cues can be powerful signals to eat even when there is no physical need for food. A pattern of food intake called “grazing” is defined as the uncontrolled and repetitive eating of small amounts of food. It is not known if this pattern may be associated with overeating and obesity. 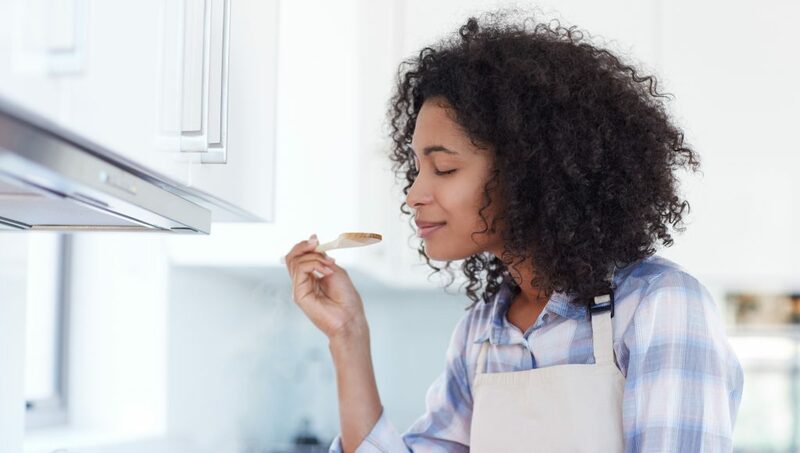 Mindful eating involves paying attention to eating while it is occurring, including attention to the sight, smell, flavors, and textures of food, to the process of chewing and may help reduce intake by affecting the individual’s response to non-homeostatic cues for eating. Indeed, high levels of mindfulness are associated with lower levels of obesity. Hence, mindful eating may counter non-homeostatic eating. It is also possible that it may counter the “grazing” pattern of intake. In today’s Research News article “How does grazing relate to body mass index, self-compassion, mindfulness and mindful eating in a student population?” (See summary below or view the full text of the study at: https://www.ncbi.nlm.nih.gov/pmc/articles/PMC5846935/ ), Mantzios and colleagues recruited college students and measured them for body size, mindfulness, self-compassion, mindful eating, and “grazing”. The relationships between these measures were explored with a regression analysis. 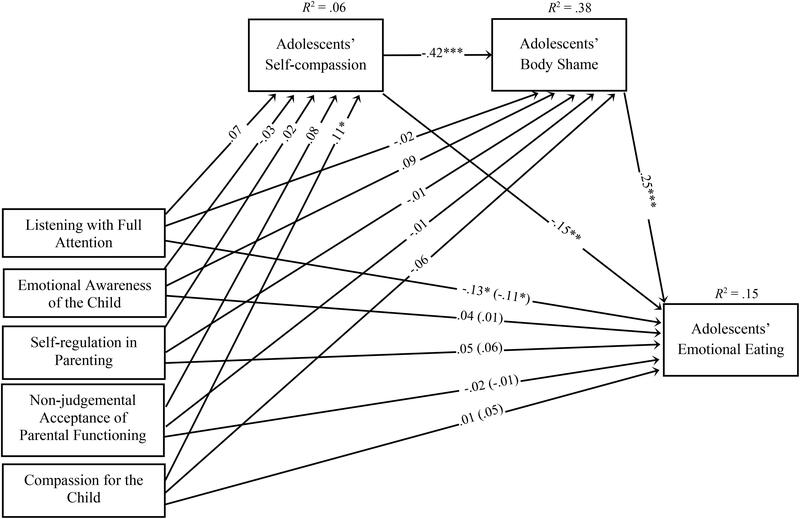 As predicted, they found that the higher the levels of “grazing” the larger the degree of obesity (Body Mass Index, BMI) and the lower the levels of self-compassion. In addition, they found that the higher the levels of mindful eating the smaller the degree of obesity. Finally, they found that the relationship between ”grazing” and body fatness was mediated by mindful eating. That is, ”grazing” is associated with reduced mindful eating which, in turn, is associated with lower body fatness. Hence, it appears that “grazing” is associated with obesity by being associated with less mindful eating. This study is correlative and thus no conclusions regarding causation can be supported. But, the result suggests an interesting potential association between “grazing” and obesity, mediated by mindful eating. Future research should look at the effect in increasing mindful eating on the relationship between “grazing” and obesity and also at the effect of reducing “grazing” on mindful eating and body fatness. It is possible that altering the grazing pattern may be a useful strategy in reducing intake and perhaps body weight and fatness. Contemporary research investigating obesity has focused on grazing (i.e. an uncontrolled and repetitive consumption of small amounts of food). Meanwhile, constructs such as mindfulness, mindful eating and self-compassion have received much attention in assisting individuals with eating behaviours and weight regulation. The association between those constructs and grazing, however, has not been explored. In a cross-sectional study, university students (n = 261) were recruited to explore the relationship of mindfulness, mindful eating and self-compassion with current weight and grazing. Results indicated that all constructs were negatively related to grazing, but only mindful eating related negatively to current weight. In addition, mindful eating mediated the relationship between grazing and current weight. Possible explanations and future directions are discussed further with an emphasis on the need for more empirical work. Eating is produced by two categories of signals. Homeostatic signals emerge from the body’s need for nutrients and usually work to balance intake with expenditure. Hedonic eating, on the other hand, is not tied to nutrient needs but rather to the pleasurable and rewarding qualities of food, also known as food cues. These cues can be powerful signals to eat even when there is no physical need for food. Mindful eating involves paying attention to eating while it is occurring, including attention to the sight, smell, flavors, and textures of food, to the process of chewing and may help reduce intake. Indeed, high levels of mindfulness are associated with lower levels of obesity and mindfulness training has been shown to reduce binge eating, emotional eating, and external eating. It is suspected that mindful eating counters hedonic eating. Mindfulness has two main components the first is present moment awareness while the second is decentering. This is a less well appreciated component of mindfulness. Decentering changes the nature of experience by having the individual step outside of experiences and observe them from a distanced perspective and be aware of their impermanent nature. The individual learns to observe thoughts and feelings as impermanent objective events in the mind rather than personally identifying with the thoughts or feelings. In other words, they’re not personal but simply things arising and falling away. This way of viewing the world should make the individual less responsive to outside stimuli. In today’s Research News article “Mindfulness Reduces Reactivity to Food Cues: Underlying Mechanisms and Applications in Daily Life.” (See summary below or view the full text of the study at: https://www.ncbi.nlm.nih.gov/pmc/articles/PMC5435775/ ), Keesman and colleagues review the published research literature on present moment awareness and decentering and reactivity to the stimuli from foods. They examine the ability of present moment awareness and decentering to decrease the individual’s resistance to food cues. 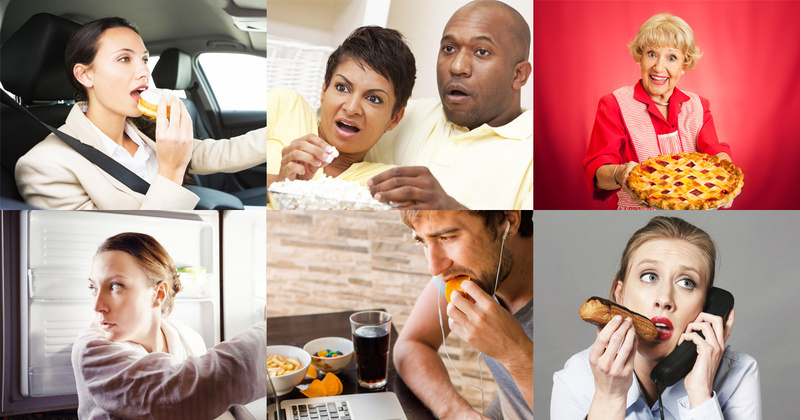 They found that the literature reported that when participants were induced to produce a decentering perspective rather than a present moment perspective, there was a large drop in their attraction to food and cravings for foods, and an increase in healthy food choices. Indeed, participants with a decentering perspective produced less saliva when confronted with an energy dense attractive food. There was even a reduction in chocolate consumption over a week when adopting a decentering perspective. Finally, it was reported that meditators who were high in decentering had much fewer food cravings. Hence, decentering reduces reactivity to food cues while simple present moment awareness does not. It is likely that seeing these cues and one’s response to them as impermanent may well make the individual more resistant to them. It is also possible that seeing one’s response to foods cues as mere thoughts that come and go, makes it easier to resist them. Regardless, it is clear that mindfulness, particularly decentering reduces the ability of food cues to affect the individual’s behavior. So, be better at resisting food with mindfulness. Mindfulness-based interventions are becoming increasingly popular as a means to facilitate healthy eating. We suggest that the decentering component of mindfulness, which is the metacognitive insight that all experiences are impermanent, plays an especially important role in such interventions. To facilitate the application of decentering, we address its psychological mechanism to reduce reactivity to food cues, proposing that it makes thoughts and simulations in response to food cues less compelling. We discuss supporting evidence, applications, and challenges for future research. Experimental and correlational studies consistently find that the adoption of a decentering perspective reduces subjective cravings, physiological reactivity such as salivation, and unhealthy eating. We suggest that the decentering perspective can be adopted in any situation to reduce reactivity to food cues. Considering people’s high exposure to food temptations in daily life, this makes it a powerful tool to empower people to eat healthily.